Ah, Cincinnati. Glorious were the days of my youth mucking about downtown, getting up to no good with the rap scallions down on Court Street, giving a piece of gingham to Emmy Lou, late nights at the cranberry bog. Okay, so I've never actually been to Cincinnati. However, I did see an episode of No Reservations where Anthony Bourdain went there so I'm pretty much an expert. When I heard a friend was going to visit family there recently I asked him about Cincinnati chili and, much to my delight, he returned with a gift! Cincinnati chili! 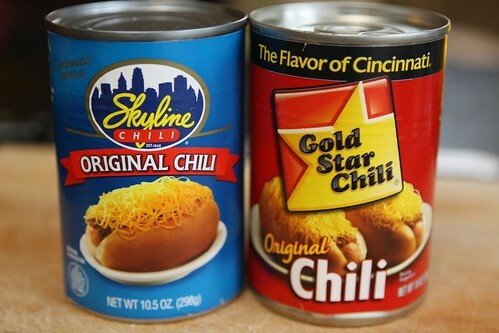 Two cans from the top two rival Cincinnati chili makers: Skyline Chili and Gold Star Chili! 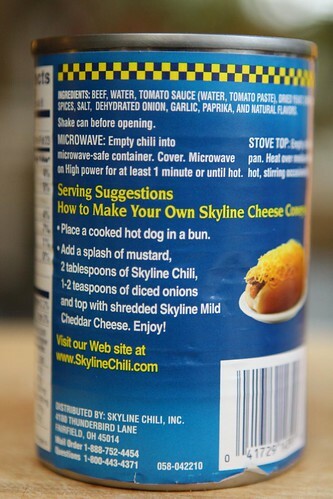 The Skyline Chili can had a recipe on the back of the can. And any recipe that begins with the words 'Place a cooked hot dog in a bun' has just got to end with happiness. I added some mustard (though I had trouble splashing it), some of the chili, and shredded some cheddar cheese for the top. I feel like I lose points by using an organic hot dog bun and an organic beef hot dog. Also I probably lose a lot of points for using a cheddar cheese that was not from Skyline and even more points by shredding it myself. I have to say that it was pretty tasty. The chili itself was a little sweet from the spices used. It reminded me a little bit of a New York System wiener which, curiously, isn't actually available in New York but is very popular in northern Rhode Island. Remove the cheese and take out the spices from the meat sauce and the two 'recipes' are nearly identical. It is really hard to find beer from Ohio in New York. 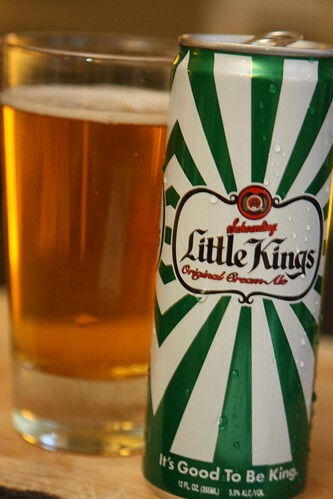 I looked and looked and the best I could find was this Little Kings Original Cream Ale from Hudepohl-Schoenling Brewing Company in Cincinnati, Ohio. I'd imagine that a few of these beers have been consumed with many a cheese coney in the past. 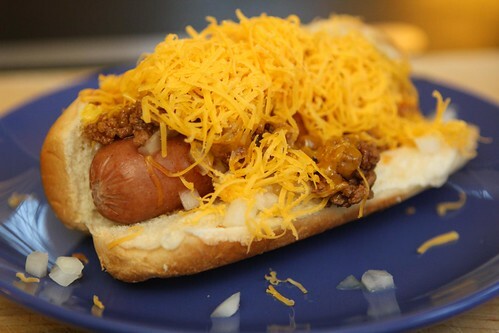 Cheese coney is, by the way, what they inexplicably call these hot dogs in Cincinnati. I was expecting this beer to be terrible but I was actually very surprised by it. It had a very soft and sweet taste to it with a strong flavor and scent of apple juice, something I've never really picked up in a beer before. This was, indeed, the perfect accompaniment to the cheese coney. Drinking this beer has renewed my faith in the entire class of beer known as cream ale. I'm actually eager to try a few more. This could be the beginning of something beautiful! Or, I could be disappointed to find out that the rest of cream ales are foul, flavorless, abominations. Ah, Cincinnati. I feel like I've experienced a sterilized version of your majesty this evening. Now . . . what would Cincinnati be like if I were in charge? I guess you'll have to tune in tomorrow night to find out!